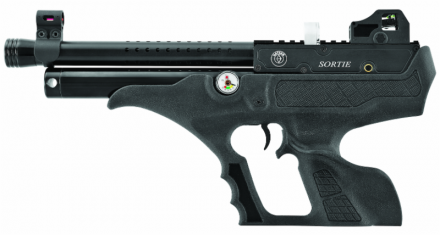 Solon, Ohio (July 31, 2017) – Air Venturi, an exclusive airgun, airsoft and ammunition importer of leading international airgun brands, is introducing a brand new addition to its innovative Air Bolt line. The latest release brings .35 caliber Air Bolts to accompany the successful .50 caliber Air Bolt introduced in 2016. 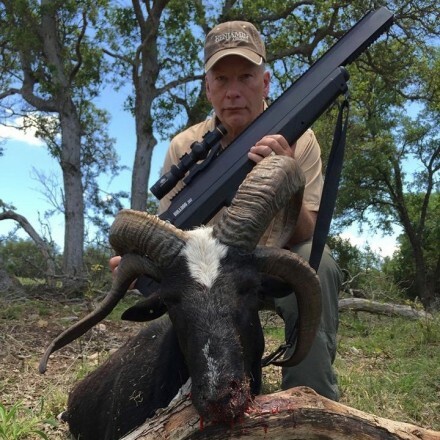 This new caliber increases the versatility of .35 airguns, as well as offering new possibilities of hunting different sized game effectively. Both .50 and .35 caliber Air Bolts are constructed of 100 percent Hi-Modulus Carbon Fiber with a small outside diameter that produces maximum speed and accuracy. With the 100 grain field tip, the .35 cal Air Bolt weighs 375 grains in total. For .35 and .50 caliber PCP airgun options that accept the Air Bolt by Air Venturi, visit Air Venturi. (July 18, 2017) Registration for the 2017 Crosman All-American Field Target Championship, which will be held July 21-23, 2017 in Rochester, NY closes on July 18, 2017 at 11:59 PM EST. Airgun competitors can register online through today for the three-day competition which features multiple shooting matches including the main two-day rifle event. 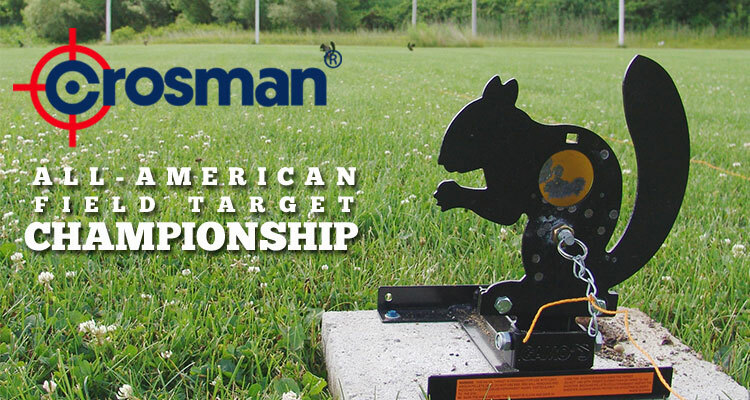 The Crosman All-American Field Target Championship will be held once again at the Rochester Brooks Gun Club. There are five divisions and classes for competitors, Open, Hunter, WFTF, Freestyle and Pistol. In addition to the main rifle event, this year will also feature a pistol match, the Quigley Bucket Match and the Pyramyd Air Gunslinger match. Those wishing to register can do so online today by visiting www.crosman.com/connect/crosman-field-target-championship/. The list of registered participants is also available at www.crosman.com/connect/2017-crosman-all-american-field-target-championships/. Every registered participant is invited to the Friday night reception and receives a gear bag and food vouchers. FORT SMITH, AR (April 25, 2017) – Umarex USA announces its upcoming exhibition at the 146th NRA Annual Meeting and Exhibits following high demand generated by its introduction of innovative new products at the most recent Shooting Hunting and Outdoor Trade (SHOT) Show. The NRA Annual Exhibits, this year April 28-30 in Atlanta, Georgia, is one of the most attended consumer gun shows every year. Exhibition at the NRA Show provides consumers a relaxed venue where they can handle a variety of Umarex Airguns like the Gauntlet, Octane Elite, and Umarex Forge. Consumers will also have opportunities to get one of the new Big Blast reactive target caps and learn more about the .50 caliber Umarex Hammer and Umarex ARX ammunition. Show attendees are encouraged to visit Booth 656 to check out the special NRA Edition of the 7.5 inch Colt Peacemaker only available at UmarexUSA.com. Attendees can also shoot the new Umarex Gauntlet at the NRA Airgun Range room #B308 and B309. Sign up for email notifications about Umarex Airguns at UmarexUSA.com. 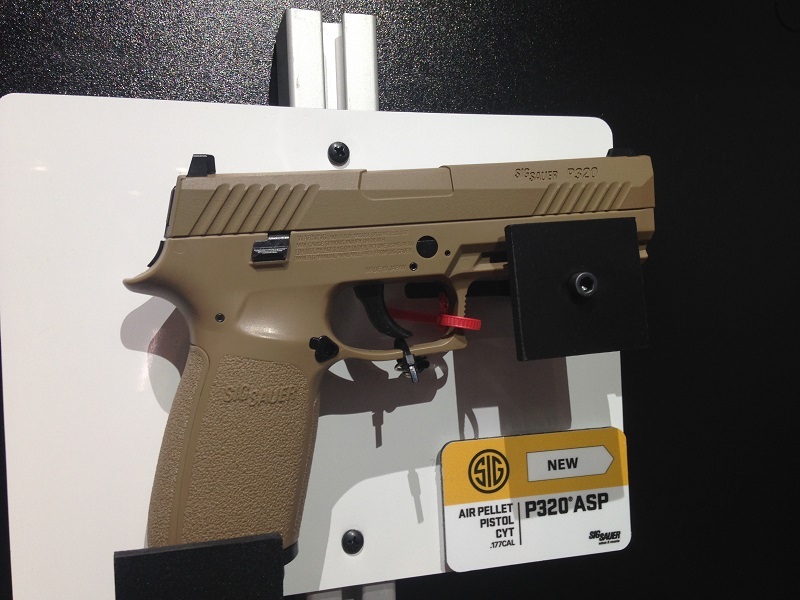 SIG is currently displaying two new additions to the ASP airgun line, the P320 ASP pistols in Black and FDE. 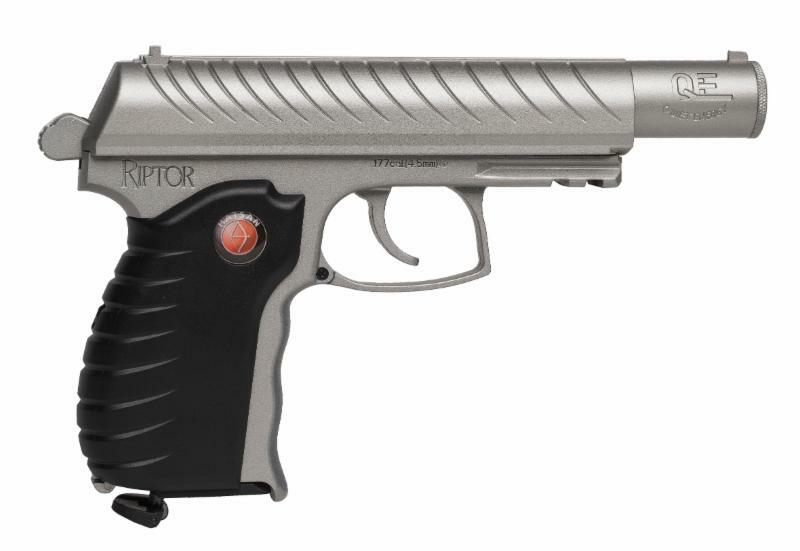 Chambered for .177 pellets, the ASP P320 series features an all-metal slide, rifled steel barrel, and polymer grip. The rearward section of the grip breaks away to reveal the CO2 canister housing which powers the action, and the P320 ASP comes complete with an impressive 30-round rotary magazine. Solon, Ohio (Jan. 12, 2016) – Air Venturi, an exclusive airgun, airsoft and ammunition importer of leading international airgun brands, today introduced the Air Venturi Electric 4500 psi Air Compressor. This release marks a welcome addition to the PCP airgunners’ toolkit . Currently, PCP owners have to rely on local fire departments and SCUBA shops to refill their air tanks and hand pumps to fill their guns. The new Air Venturi Air Compressor allows users to refill their air tanks in the convenience of their own home in as little as 10 minutes. Air Venturi’s compressor plugs into a standard 110V outlet and refills air tanks up to 4500 psi. The kit includes a hose with female quick disconnect fitting, extra seals and O-rings, male-to-male fitting and replacement filter. The compressor is perfect for Air Venturi carbon fiber and aluminum tanks currently available at AirVenturi.com. Please visit us at the Air Venturi Booth #2007 at the 2017 SHOT Show for a first-hand look at the Air Venturi Electric Air Compressor as well as our selection of new air rifles, air pistols, and accessories. 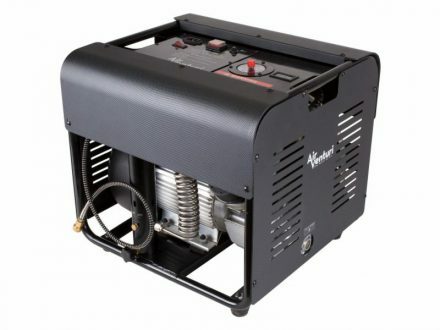 View AirVenturi.com for more information on the Electric Air Compressor. 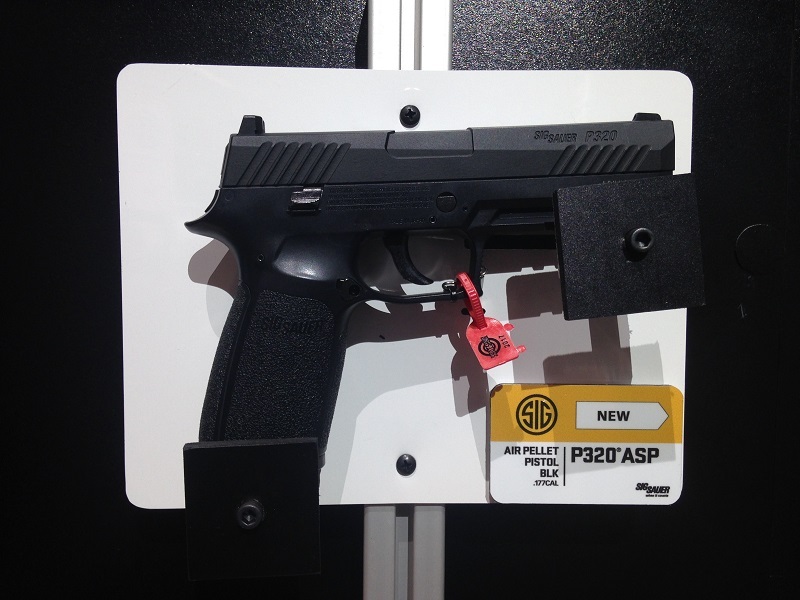 Newington, NH (January 4, 2017) – SIG SAUER, Inc., designer and manufacturer of the world’s most reliable firearms, optics, ammunition, airguns and accessories, adds to its world-class Advanced Sport Pellet (ASP) line of airguns with the introduction of the new P320 CO2-powered pistol. This semi-automatic .177 caliber ASP pistol is the first air pistol in the world to feature a 30-round belt magazine and is designed to look and feel like the highly-acclaimed SIG SAUER P320 centerfire pistol. Weight and trigger pull are virtually identical offering recreational shooters, professionals and competitive shooters another outstanding training tool to easily hone their shooting skills at greatly reduced costs. The P320 ASP air pistol features a metal slide with realistic blowback action and polymer frame in addition to a smooth slide safety. 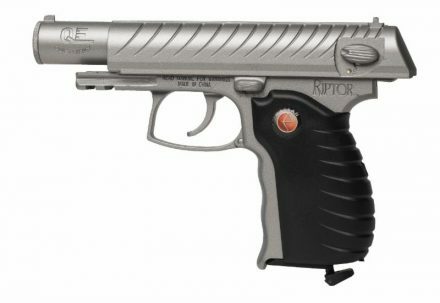 This air pistol is double-action only, has a front blade sight, fixed rear sight and an accessory rail which allows easy mounting of a laser or tactical flashlight. The 12gr CO2 cartridge is inserted and removed through a compartment in the side of the grip. Velocity is up to 450 fps; however, velocity results may vary depending on pellet weight, temperature and altitude. The P320 ASP air pistol also shoots steel BBs in addition to pellets and is available in two colors – Black or Coyote Tan. CLEVELAND, OHIO (September 27, 2016) – The third annual Pyramyd Air Cup, hosted by the world’s largest internet airgun retailer Pyramyd Air, boasts the best attended AAFTA Grand Prix event for field target shooting in the U.S. during 2016. Hosted in conjunction with local AAFTA club, the Ohio Airgun & Field Target Shooters Association (OAFTSA), nearly 100 shooters descended upon the Tusco Rifle Club in New Philadelphia, OH September 9-11 for the most challenging and exciting airgun match of the year. The third annual competitive shooting event attracted amateur and professional shooters from all over the country and delivered winners in multiple airgun shooting disciplines including Field Target shooting, the fast-paced GunSlynger event, and the PayDay Challenge. “We introduced a record number of people to the sport of airgunning at this year’s Cup,” says Pyramyd Air CEO, Joshua Ungier. “And while the competitive spirit was remarkable amongst shooters, it was the almost tangible level of anticipation for each exciting course of fire that really sets the Pyramyd Air Cup competition apart from others,” he said. “Field Target is one of the most difficult shooting disciplines out there,” says Pyramyd Air Cup Match Director, Tyler Patner. “Combine the multiple skills required to rise to the top of your game, with the myriad of factors you take into account at each lane, and you’ve got a challenging sport,” he says. “Targets are small, metal silhouettes of animals that consist of a kill zone and a colored paddle,” explains Patner. “Placed at unknown distances from between 10 yards to as far as 55 yards, the targets have kill-zones ranging in size from 3/8 inch to 1 1/2 inches. When the pellet passes through the kill zone and hits the paddle, the target falls and you’re awarded a point,” he said. “It’s a game of precision and practice. You range find with your scope, dope for distance, take the wind into account, and then you have to execute. It’s really a lot to take in,” he added. “There are different restrictions based upon your selected class, but the challenges remain the same. Wind doping, range finding, and remaining mentally tough over the entire course of fire are the biggest hurdles competitors face,” Patner says. For more about information about the official results of each competition, including the GunSlynger and the PayDay Challenge, see PyramydAirCup.com/2016-match-recap. Solon, Ohio (August 1, 2016) – Air Venturi, an exclusive airgun, airsoft and ammunition importer of leading international airgun brands, today introduced the Air Bolt. The new, 430 grain, carbon fiber bolt may be used in any .50 caliber precharged pneumatic (PCP) air rifle with a barrel 22 inches or longer, and effectively transforms the PCP gun into a high-powered bolt slinger. 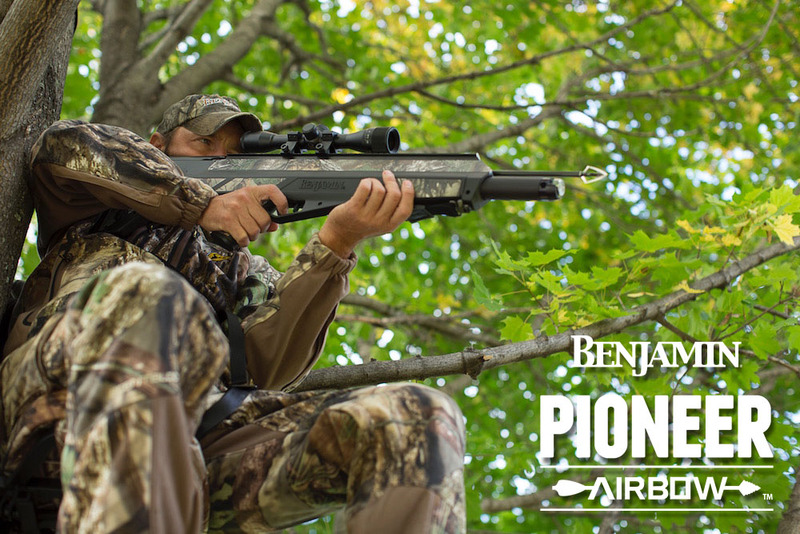 “The Air Bolt by Air Venturi converts your .50 caliber PCP air rifle into a powerful archery hunting tool intended for large game hunting,” said Air Venturi Director of Business Development, Paul Milkovich. “This ground-breaking innovation represents the ideal marriage of airgunning and archery by delivering an affordable addition to your existing airgun ammunition resources. With the Air Bolt, you don’t have to spend a lot of money on an entirely new archery platform. Simply take the .50 caliber PCP air rifle you already own, and add the ground-breaking Air Bolt to your existing ammunition collection. The Air Bolt comfortably fits any PCP air rifle with at least a 22-inch barrel, and accepts standard broadheads,” he says. The Air Bolt is constructed of 100 percent Hi-Modulus Carbon Fiber with a small outside diameter that produces maximum speed and accuracy. With the 100 grain field tip, the Air Bolt weighs 430 grains in total. 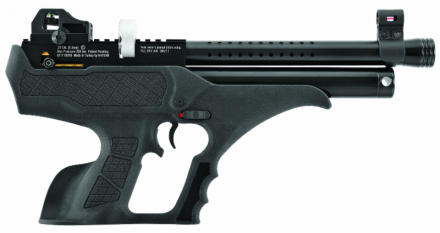 Air Venturi Announces Ataman Airguns Now Available In U.S.
Cleveland, Ohio (January 14, 2016) – Air Venturi, an exclusive airgun, airsoft and ammunition importer of leading international airgun brands, today announced that Ataman M2R air rifles are now available in the U.S. 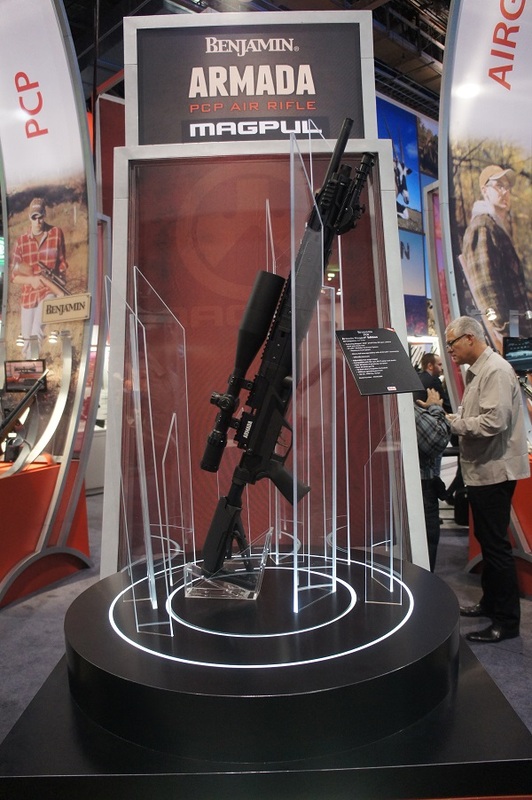 Built in Russia, the Ataman M2R series precharged pneumatic (PCP) air rifles will be distributed in North America by Air Venturi. The rifles feature five different stock configurations, and are offered in multiple calibers ranging from .177 to .35. 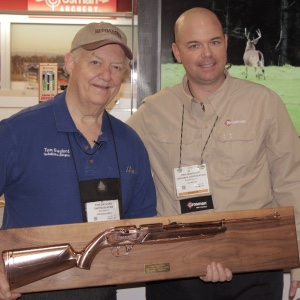 “Ataman air rifles are known for their high quality, exceptional reliability and cutting-edge technologies,” states Air Venturi Director of Business Development, Paul Milkovich. “By combining the most up-to-date production technology, superior materials, and the legendary expertise of Russian gunsmiths, Ataman has created world-class PCP production guns that we are proud to offer throughout the U.S. Visit booth #2007 at SHOT Show for a hands-on look at these phenomenal air rifles,” he added. “Whether you choose the .35 caliber version for dispatching hogs, the .22 caliber for pest control, or the .177 for target shooting or plinking, rest-assured you’re getting a meticulously crafted gun worthy of handing down to the next generation,” says Milkovich. The M2R Carbine is offered in walnut only, and is available in .177, .22, .25, and .35 calibers. The ergonomic, ambidextrous stock features a checkered forearm and grip, robust buttpad, and raised cheekpiece. The ability to fill to 300 bar and regulated pressure control ensures shooting accuracy and the maximum number of shots. The pressure gauge and charging port are conveniently located in the front plug. 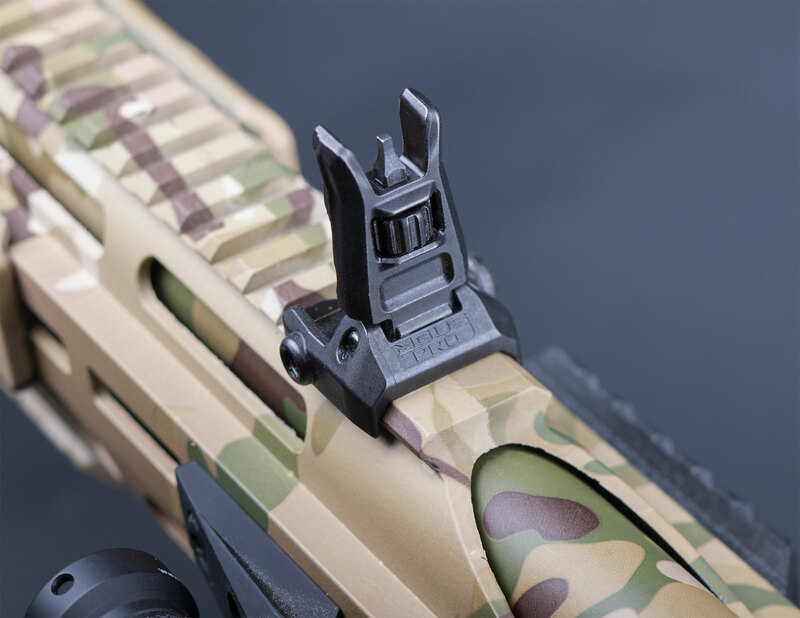 The Picatinny mounting rail is milled directly to the receiver. Available with a walnut or black synthetic soft-touch stock, the M2R Tactical Carbine resembles sniper-type rifles. 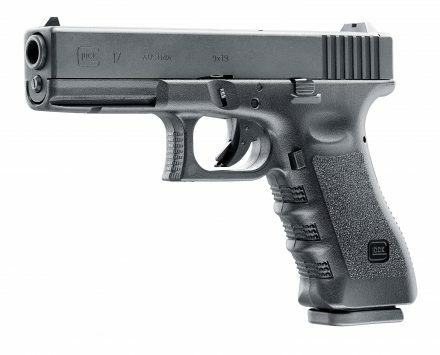 This gun is available in .22, .25, and .35 calibers. The comfortable, pistol grip stock has a complex body shape with a grip that fits right-and left- handed shooters. 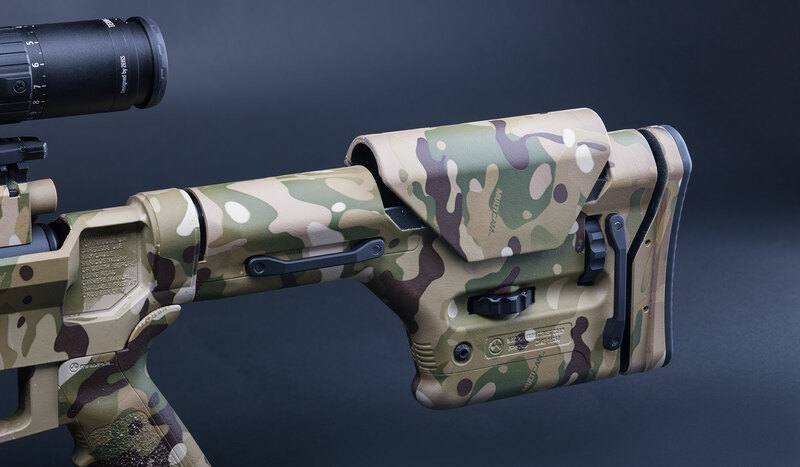 The forestock is extended and the stock has an adjustable cheekpiece and buttplate that enable shooting from different firing positions. The MR2 Bullpup is offered in two types. Type 1 features the synthetic soft-touch stock while Type 2 has an attractive walnut stock. Each version is offered in .22, .25 and .35 calibers and the smaller sized stock is great for people who travel or hunt where a standard sized gun would not be ideal. The M2R Bullpup has a Picatinny mounting rail, and the barrel receiver, clamps, and trigger are integrated into the main rail. The MR2 Ultracompact Carbine features smaller dimensions and weight compared to other PCP rifles while maintaining the same on-target accuracy. The stock is adjustable for different lengths, and it folds to the side shortening the rifle length, making it convenient for carry and storage. Because of the telescopic stock, the gun can be used for shooters of any size. The pistol grip offers easy shooting for right- and left-handed shooters. Please visit us in booth #2007 at the 2016 SHOT Show for a first-hand look at the new Air Venturi Ataman air rifles and all of the other new Air Venturi products. Cleveland, Ohio (October 27, 2015) – Air Venturi, an exclusive airgun, airsoft and ammunition importer of leading international airgun brands, astonishes airgunners with news of the first notable BB safety innovation in nearly 100 years. The groundbreaking new Smart Shot BBs feature a double coating of copper plating surrounding heavyweight, lead shot. 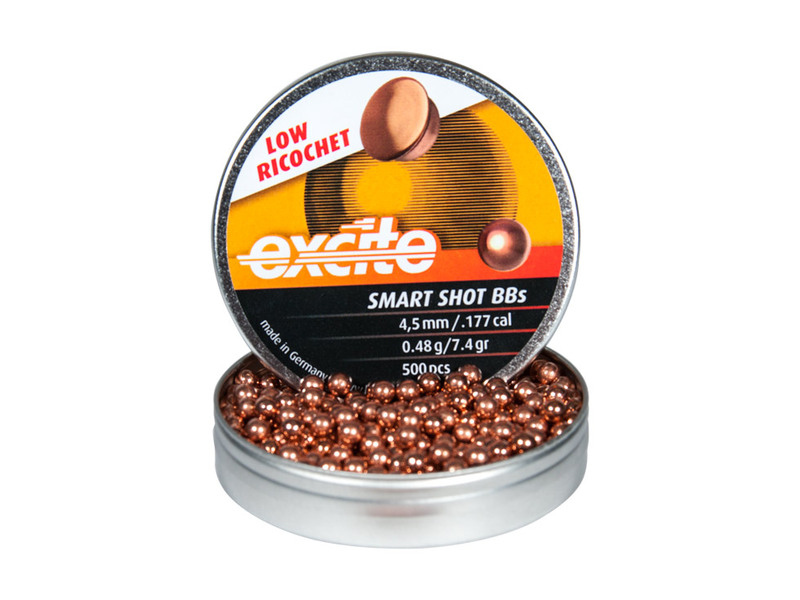 Since resistance to ricochet is exceptional with the new Smart Shot BBs, many safe options for various types of hard targets and shooting disciplines are now available to shooters. Another advantage of Smart Shot BBs is their distance and power; especially when shot from pneumatic or CO2 powered guns. “These BBs hit harder because the lightweight steel of traditional BBs has been replaced with much heavier lead,” Milkovich stated. They also have less friction and remain clean from oxidation during handling and storage because of their copper plating. “All of these features make Smart Shot BBs a superb option for gallery rifles and indoor shooting ranges,” he said. 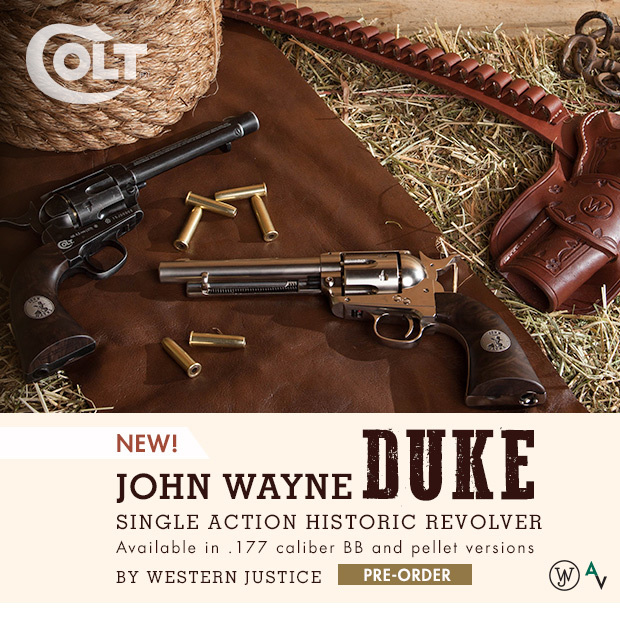 Air Venturi is currently offering a line of John Wayne ‘Duke’ Colt SSA CO2 revolvers, chambered for both pellets and bbs. The revolvers come in several finishes, and are faithful replicas of the Colt SSA revolver.